Shoppers at PAK’nSAVE Botany will notice the store has a shiny new van that’s a little different to your average petrol car. It’s part of a fleet of 100 percent electric vans that are cruising quietly around New Zealand, branded with New World, PAK’nSAVE and Four Square logos. Foodstuffs New Zealand officially launched the fleet at a ceremony attended by Foodstuffs New Zealand Managing Director, Steve Anderson and MP for Selwyn Amy Adams at New World Lincoln in Canterbury on August 4. Foodstuffs New Zealand was awarded $500,000 by EECA from the Low Emission Vehicles Contestable Fund to implement a project that involved importing 28 electric vans from the UK. PAK’nSAVE Botany was selected to be part of the project. 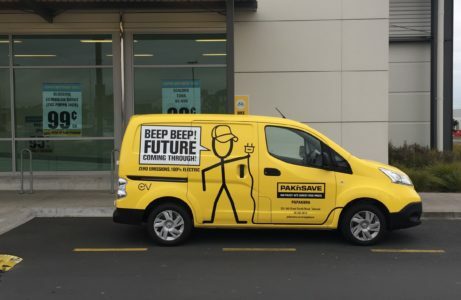 Sustainability Manager for Foodstuffs NZ Mike Sammons says the van rollout complements the electric vehicle fast charging points that are being installed in a number of stores. “For Foodstuffs, this is just a small part of our efforts to reduce our carbon footprint and make our business more environmentally sustainable. “Fully electric vehicles produce no emissions improving both local air quality and helping reduce global warming. They use battery technology, which powers an electric motor. They require less maintenance and are extremely quiet. They’re also very functional and can accelerate and climb hills better than a standard petrol vehicle,” Sammons says. There are 28 stores involved in the project. All 28 stores will have their vans on the road by the beginning of September.